Will and Lily discover the presents under the tree. Will shows off his new broom and favorite present. Santa must have know that sweeping is one of his favorite past times. Evan and Lily check out the Little People farm. Will sweeps over and finds the Giraffe. Evan and Lily discover the Giraffe too. 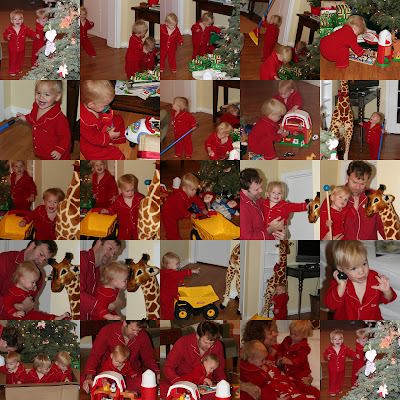 Evan gets a phone in his stocking and walks around talking and doing things just like David. He doesn't put it down most of the day. Hugs from Gramma G (GG). We saved the best present for last. When all through this house, all the creatures were stirring, not quiet like a mouse. They shut off our power and water today. Apparently the owner had some outstanding bill. The guy turned it off right in front of me even though I showed him my lease agreement and are current customers in good standing. I wanted to call his boss...and his mom. Shame on him. I was mad as a hornet. Don't make an eight months pregnant mom of three toddlers mad. The owner was even more irrate as the bill was in dispute and they had assured him they were working it out. I'm sure he felt horrible putting us in this situation too. We had a flurry of calls and a bit of drama this afternoon. I have a few things to say about Austin Utility and their red tape but let's just leave it at 'not very helpful'. The owner went down and sorted it out. Good news is that they are supposed to be back on their way out to turn it back on right now. And I'm relieved that the nice owner is not in jail as he was hopping mad when he headed to their offices. My mom's flight will be in soon, hopefully all will be resolved before tonight or we will all be huddled together sleeping on the floor in our old house. It was a crazy Saturday but we are moved in our new home and fairly settled. It was nice to move so close by. We could make several trips and unpack as we went. So by the end of the day we only had a couple of boxes to unpack. There are still some things at the old house. But it is easy enough to walk over and get anything we need. And honestly it felt great to sort through all the closets and have a chance to clean things out and get organized. The layout of the new house has been great for the kids. They have more room to run around, a big playroom just off the main living room and of course the safe contained yard I wrote about earlier. It is going to be a lot easier to keep them entertained here. And I need the break. It is getting a bit harder to chase after them as my belly grows. The worst thing about the move is that they are not napping - yikes. We don't have their blackout shades up so that may be the issue. Work has been crazy too. I'm working on completing a website and rolling it out to about 40 countries before the x-mas break. It will feel good to have that done and be able to enjoy my time off. David and my offices are both closed next week through the new year. And my mom comes tomorrow so that will be a big help. I'm on my own tonight. David has been travelling all week again trying to squeeze in last meetings with clients before the holidays and before the no travel zone with Quattro's impending arrival. I decided to see how long the babies would stay in the bath, splashing and giggling and having a grand old time if I didn't remove them. I gave up at 50 minutes of fun and took them out. Both boys promptly peed on the floor. I guess I should have been thankful they didn't go in the tub. Then it occurred to me that this may be our last night in this house. It may be their last bath in this tub. We are moving tomorrow and the decision on our house project is still pending. It makes me a bit sad. I like this little house and our place in this world. This is also the last month our kids get to be our babies. Not too much longer and there will be a new baby in our home. If you know me, you know that I can't stand clutter. But that doesn't mean that I'm immune to it. We have to constantly work at it and we still have too much. 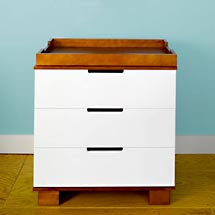 I love garage sales and moves, it gives you incentive to get rid of lots of things that have accumulated over time. I like seeing my things going to others who will put them to good use, instead of gathering dust in my house. 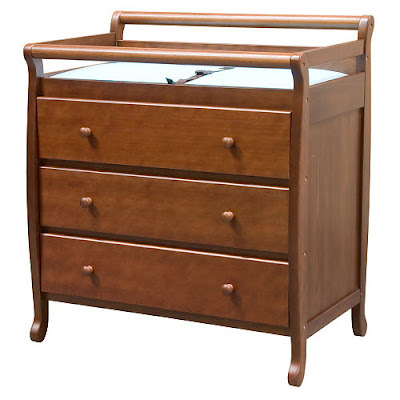 I dread thinking of all the clutter we will accumulate with four children in the house. The toys and books and clothes seem to multiply at night. They put a basket next to their Christmas tree prior to the holiday. The children are asked to go through their toys and find toys to donate to other children to put in the basket. Before Christmas the basket goes off to share with other children and it makes way for new toys -putting old toys to good use and clearing out clutter. Brilliant! We are moving next weekend, theoretically. We don't have movers and have not packed. But we are going to try and line it up this week. We are only moving two houses down, and we don't have to empty out our house completely - yet. We just need to move the things we use regularly. The new yard is perfect for us. It is fenced in and has grass and a low deck without a drop off. There is lots of open playspace without the hazards of our heavily landscaped yard, deck and stone path. The trips love being outside. They have tons of fun at our park on the playscapes and just as much fun exploring, picking up leaves and finding sticks. The park is wonderful, but it is a lot of work to keep up with them. It will be nice to have options. I think we will be spending most waking moments outside as long as the weather permits. Luckily we have very moderate weather here in Austin. 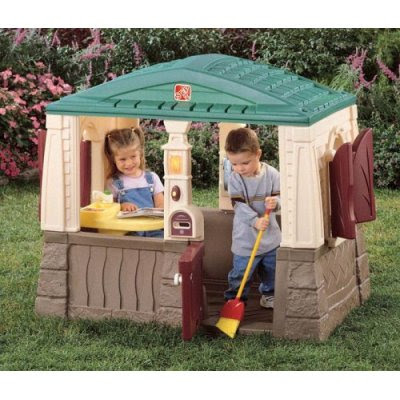 So I've been researching playhouses and playscapes to make the yard even more fun. I found this 'neat and tidy cottage' from Step2. It has a door, shutters they can open and close, a doorbell and a play sink. They may outgrow this playhouse before the other alternatives but I think we will get lots of mileage over the next couple years. I like that you can easily see in the house and that we won't have to hover (like some of the playscapes would require). I took too long to decide, so we won't get this by Christmas, but it will be a good gift for them just before Quattro arrives. And probably bigger gift to us as it will provide lots of entertainment. I decided I better hop on getting Quattro's nursery items ordered so we could get everything by Christmas. I'd like to set up the room during our time off. David likes modern, I like simple traditional. 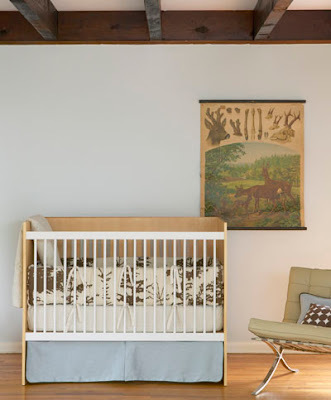 I think I this Dwell forest bedding is something we can both be happy with. And I found it at a reasonable price on ebay. 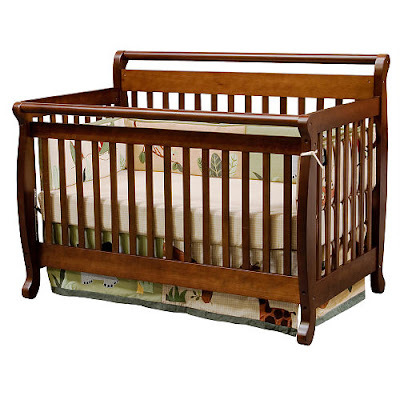 This new Baby Mod line of cribs at Walmart have the look of Netto and Ouef at the fraction of the cost. I didn't get to see it in person but the reviews were great. 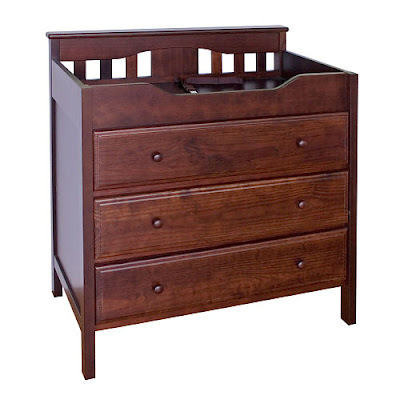 This changing table easily converts to a dresser. Light sky blue for the walls. Cream linen drapery or roman shades. 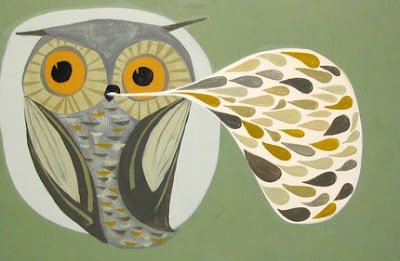 Our chocolate brown glider and some affordable art from Etsy to finish it off. I'm going to the doctor every two weeks now for check ups on Quattro. He is doing great. This Monday was sucking his thumb during the ultrasound. Six weeks until we get to meet him. I'm so happy with our little Christmas tree. We picked it out together last weekend. Will, Evan and Lily adore our tree too and now can all say 'tree'. They like to pat the branches carefully and they have figured out how to place the ornaments on the tree. A few of the hand print ornaments we made last year have some nibbles missing from the edges. We must have some little furry friends in the attic. The kids are also quite fond of our neighbor's lighted reindeer that moves it's head slowly from side to side. I think they are going to enjoy the Christmas festivities this year. Their excitement makes it all new for us and more fun. A recent Austin multiple moms post brought up the topic of holiday traditions. I love traditions and look forward to carrying on some old ones and creating new ones for our growing family. I've always enjoyed going to midnight mass on Christmas Eve and remember getting to pick out one present before mass. I'd look for the box with a squishy top, a clear giveaway that it was a baby doll and a perfect present to take to mass. Several replied that everyone got new PJs on Christmas Eve. I love that idea. And makes for great Christmas day photos. Leaving cookies and milk for Santa was also high on the list. Our Santa prefers Chocolate Chip. And I liked the idea of visiting the Christmas Tree farm as a family to pick out the tree. We have a good one nearby, Elgin Christmas Farm with hayrides. Not sure if the kids are old enough to enjoy that yet. One memorable Christmas we spent at my Grandparent's farm and stayed in their tiny farmhouse. We cut down a cute little Charlie Brown Christmas tree and decorated it with a few candies and whatever we could round up. It was pretty chilly and we didn't have heat but we bundled up and it was a lot of fun. I'd also like each child to get or make an ornament each year. Last year I made heart ornaments with each child's handprint using crayola's magic maker clay. Here are Will, Evan and Lily last year with our new Christmas Stockings. Please share your favorite holiday traditions. Everyone has warned us that construction projects are a pain, that nothing goes right and everything takes longer than expected. We were OK with that to some extent. But now we are facing issues and we have not even started yet. Financing is all lined up - finally - and luckily there were two rate decreases along the way. Our rental house (only two houses down) is getting it's final touches and will be ready for us in a week. But come to find out our construction permit expired. Our contractor was tasked with keeping it alive. They thought they did by scheduling the inspection before our contract expired. But the contract expired the day before the inspection and now the city is saying that the permit is dead. Now, I haven't ever explained the history here. But right before the trips were born, when I was humongous, we rushed to complete the plans and get them submitted in order to beat the deadline for new McMansion laws. For those of you who are unfamiliar with this local legislation, the idea is to limit excessive development and retain the charm of these old neighborhoods. But in reality the actual rules don't defend the 'charm' and are arguably too strict. 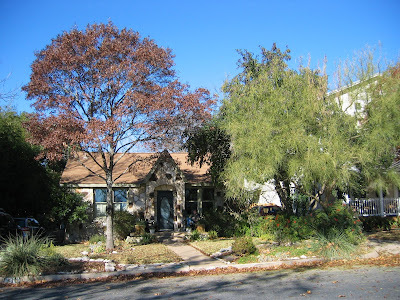 At least arguably too strict for a family about to have four children living in a bungalow in central Austin. I'll spare you the details, but at a high level the rules say we can expand our house up to 2,500 sq ft total. However, with the latest rules - if our garage is less than 10 ft from the house (ours is 9 ft) then you have to count the square footage of our garage. I don't understand the rationale here, but that means the city wants our house to only be 2,100 sq ft.
We have protested with the city and our contractor is staked out there today to plead our case. If we lose this battle, we have to reapply for a permit and shorten the garage by one foot! (not sure how long re-applying will take and it will require some additional drawings) or apply for re-instatement (takes more than 30 days plus a fee). The other thing is, we really went out of our way to ensure the plans retain the charm of the house, even at the expense of changing the roof line. From the front, the house won't look much bigger. The slope of the roof will be more steep, more in line with the English cottage architicture and we will be adding a big shed dormer window to balance the house and add views overlooking the park. Either way, if we can't get this decision overturned it is going to cost us time and money. Either way we really need to move soon. There is no place to put Quattro in this tiny house. We made it safe to Gramma G's house in Florida for Thanksgiving. We had a bit of a bumpy start - we got to the airport in the morning and discovered that we were rescheduled for a 7pm flight. Our second try went pretty smoothly. Papa and Grammy helped us get unloaded and to the gate. It was past bedtime so the flight was a bit rough, but at least it was only a two and a half hour trip. The traveling was well worth it. The kids had a blast at Grandma's house. She had lots of new toys for them, a nursery set up with three pack and plays and animal art work hung especially for them at their eye level. 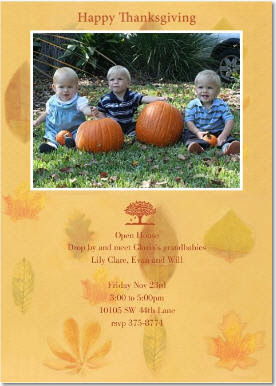 Grandma G also hosted a big open house for friends to meet her grandbabies. We had a great turnout and the babies enjoyed all the attention. Another highlight was playing with Aunt Audrey. Her dog Gracie was a bit hit too. Especially with Will who is crazy for dogs. Their first thanksgiving dinner got cheers all around. And Will got the drumstick. Lily loves using her big girl spoon. Mmmmm...mashed potatoes. Hope you all had a great thanksgiving too. We had a major house organization/cleanout this past week ending with a successfull garage sale with the Parkers and the Peters over the weekend. We only made $250 but cleared out more than four car loads of stuff. We were finally able to get rid of the TONS of extra baby stuff we accumulated over the last year plus clean out our wardrobes and garage. We were motivated by Quattro's impending due date (and my subsequent nesting) and our move. Yes, move. We are planning on moving two houses down very soon after Thankgiving because we are starting the BIG PROJECT - we are adding a second floor and remodeling the kitchen. The new floor will include a bedroom for the triplets, a nursery for Quattro (that will someday be Lily's room), a shared bathroom with large tub and double sinks, plus a family room with a great window seat overlooking the park and lots of toy storage. Down stairs we are changing the layout and converting the current kitchen and study to a large kitchen. David will get a new office out of the deal - we will be converting the trips room now to a small getaway and workspace. Now I'm ready to take the proceeds from the garage sale and purchase Quattro's crib. 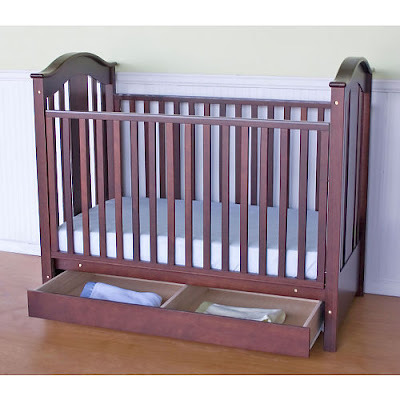 He won't get a boutique crib like the trips but they have some cute options online for great prices. Let me know if you like either of these. 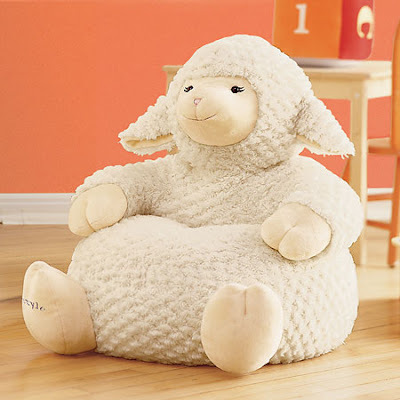 Oh, and I think he needs LuLu the Lamb. We will be flying to Florida for Thanksgiving this year to visit Grandma G. It will be our first trip to see her with the babies and finally a chance for her to show them off to her friends. I'm looking forward to the trip. Our first flight with the trio to their great grandma's 90th birthday in June was a bit of a disaster. The babies were actually very good but we had a layover, excessive delays, and a long car ride once we arrived to boot, so by the end they all fell apart and needless to say we were exhausted. At least we had grandparents and David's sister and fiance to help. We vowed never to travel again, at least not until the kids are in high school, but this is an important trip and last chance to visit grandma before Quattro arrives. This time it will just be David, me and our trio. We bought an extra ticket so we could put one of our gang in a car seat, the other two will be in our laps. We got a direct flight and are taking the first flight of the day there and back to try and avoid holiday travel troubles. Once we arrive in Florida we will get a rental car with the two extra car seats and drive the remaining hour and a half to my mom's house. For the plane ride, we will pack plenty of snacks, some new toys and a change of clothes (I forgot this critical item last time and had to buy new clothes in the airport because they were a mess). This time we don't need formula or baby food which simplifies things a bit. Dr. Cowan's office called - we are officially on the hospital books. Quattro's delivery via c-section is scheduled for January 18th, 7:30am. I'm to report to the hospital between 5:30 and 6am, he should be in our arms by 8am. I wonder who he will look like. From the ultrasounds his face looks a bit rounder like Will, but who knows. Only about two more months, we better get ready. He started out his day with a jog with our trio, he has been really good about getting out several times a week and running with the babies. They love it and he is getting really fit. I got him a jogging watch for his birthday present. We also had a little party at Vino Vino a great wine bar not to far from our house. It reminds me of some of our favorite San Francisco bars, it has modern but cozy laid back feel. It is a wine shop during the day and they have wine store prices instead of restaurant prices on wines so you can get some nice bottles. I'm looking forward to going back after Quattro is born so I can enjoy some myself. Thanks to all our friends who made it out to celebrate with us. And triple thanks to Grammy and Papa for babysitting our trio so we could go out. Looks like our babies may finally have kicked the stomach flu. Lots of giggling today and everyone was in good spirits. The weather was beautiful too. Tonight after bathtime they were having a blast chasing each other around the dinning room table and laughing. Not sure if David and I have recovered from all the sleepless nights yet, but at least things are looking up. We went to the doctor last Friday to check in and make sure everyone was ok. They ran a bunch of tests that came out fine as they were reluctant to give us more anti-nausea medicine without checking lest they miss something else. But it seems that it really was just a bad stomach bug that lasted almost two weeks. Both boys lost over a pound, that pushed Evan from 25 percentile in weight to down to 5 percentile. We worked on making up for lost time today - starting with breakfast, four slices of french toast and two bananas between the three. Other news, Will has had a mini language explosion. He likes to point to things and is now saying that (dat), this (dis), dog (gog), cat (gat), light (ligh), baby, juice (jus), and imitates animal sounds like 'quack'.